Sunday, June 15, 2008 - Another sneak preview on the birds nest. Ok, I decided if the coast was clear, I would attempt to see if the mother bird was around or food hunting. As luck would have it, she was out hunting for food, and I could see a little bit of white fur at the top of the nest from fifteen away, no site of mom anywhere, so I very slowly approached the nest and snapped a few quick shots of the new arrivals! Didn't even know they were there since only a week ago they were still little blue eggs! So, I guess you can say Happy Father's Day! Today was a good day all around. The family spent some time with my dad at the nursing home, he received a lot of nice pajama shorts for his sleepwear, and he is doing well in the new nursing home. Hoping to see him come home after he gets back on his feet so to speak. Hope you had a nice weekend too. And hope your dad is doing well on Father's Day. June 8, 2008 - My average Sunday doing yard work around the house brings me a grand peek! This is too cool! To say the least, this has been one heck of a weekend for sure. I certainly covered a lot of bases, delivered on my expectations with clients, and I was greeted with a great surprise to round off my weekend. My weekend started off video taping a graduation on Friday night, Saturday morning I video taped a funeral, Saturday afternoon I recorded an audio session for a classical guitarist, and now this! Sunday, I am in my yard at home, doing my Sunday yard work, and right next to me, this bird takes off like a bat out of hell, the bird scared me as much as I scared her. Didn't even know she was there until she took off. 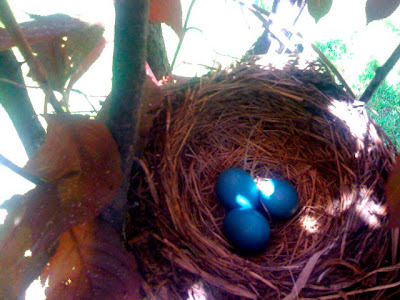 And then I realize that I stumbled upon her nest in a small tree in our yard that I was thinking of removing (NOT). There, right in front of me I see this perfect little nest. I mean it was perfect. Me being curious as I am, took a closer look and.......well out comes my iPhone and I snapped this photo. I hope you know I changed my mind on removing this tree for a while. I may even let the tree stay next year to see if I get new tenants! My motto lately has been "Expect great things, and you will receive them". I can say without a doubt, those words hold true. First, you must believe in what you tell yourself as true, then watch it unfold in front of you. Have a great week, I know I am. I had the extreme pleasure coming back from the funeral that VIP Studios video taped this morning to meet with a friend of mine Nick D'Andrea and Matt Miskin a classical guitarist to lay down some tracks for him so he could have an audio CD to promote. Nick, a school teacher heard Matt playing one day during school and was very impressed. I can see why now. 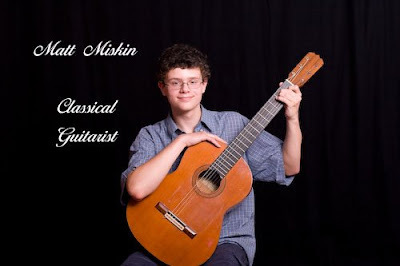 Matt being only fourteen, can play classical guitar very well. We were able to record nine tracks and burn them to a CD by the end of two hours. That's how quick the session went. One take on every song was all it took. Good going Matt! I even let the video camera run so I could have a video track should he want it. I was floored hearing Ava Maria played classical. Yes, it was a very, very good day. I had fun. Here's another track I liked a lot also recorded at VIP Studios. Mary called the night before and wanted to know if VIP Studios could video tape her father's (Hameed B. Macary) funeral so she could send it to some family overseas. Sounds like this is getting to be something more and more requested since this is my second funeral in the last few months. Even been getting requests for my business card from the funeral homes so they could contact me again. First Lebanese funeral I have done. Very close to a Greek format if you ask me. Although I would say, the job was very good and only took up two hours of my time. It was worth it, and it was a pleasure to meet Mary and her family. 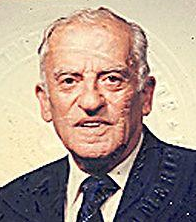 From what I understand, Hameed was the one that started the Lebanese Festivals here in Waterbury. He was also very close to the Jarjura family.